i like to read a wide genre of books, but one that i really like are biographies. especially if i find them humorous in any way. so while i do read biographies about important people i'm also big into reading biographies like tina fey's bossy pants, all of chelsea handlers books & my most recent: mindy kaling. you probably know her from the office. she writes, produces, acts & directs the office & she is really, really funny. i had heard that she put out a book, but i hadn't heard anything about it until i was at my cousin party & a couple of my cousins were saying how much they had loved the book. so i decided to try it out & it is just as great as they told me it was. she's such a spastic, funny, weird person that has the most interesting things happen to her in her life that i would think only happen in tv. which probably helps her out to write her tv shows. i also decided after reading her book to watch her newest tv show, the mindy project & i am loving it. the first episode got me hooked. it's so funny & i think the character takes a lot after her in real life, at least this is what i'm deciding since i've read her book & obviously know her so well now. 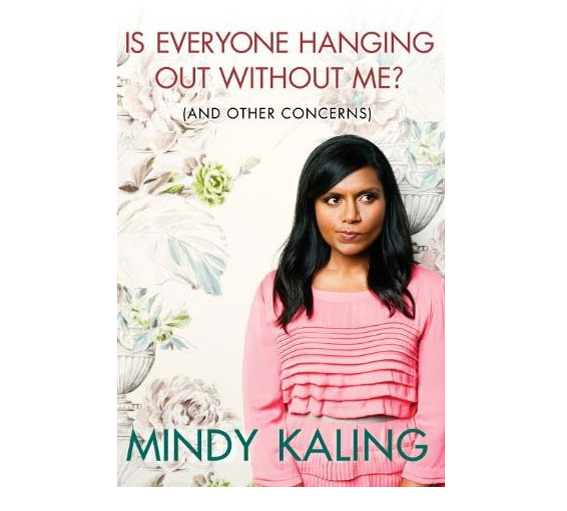 if you want a funny, light read i definitely recommend is everyone hanging out without me! i wanna read this/watch her show too! !